The Best Bakeware set has created quite a buzz among its users worldwide for its ability to saves time, money, space and effort. This bakeware set has been designed especially to make the tough process of baking easy for everyone. The Best Bakeware Set has created quite a buzz among its users worldwide for its ability to save time, money, space and effort. 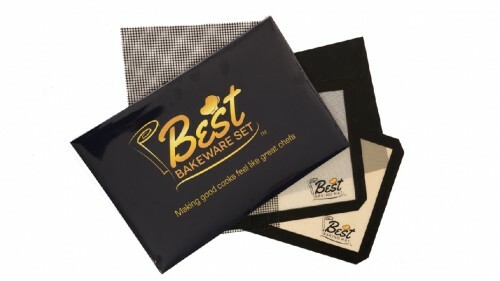 According to Best Cooking Gifts Ltd’s Managing Director, Douglas Stuart, the Best Bakeware Set will be available for purchase on 08/06/2014 at Amazon.com and at their own website, http://www.bestbakewareset.com. everyone, from the weekend cookie creator to top class chefs. The company’s motto is ‘Making good cooks feel like great chefs’, and this certainly would appear to ring true for the Best Bakeware Set! The set includes 2 silicone baking mats, which are a good 1mm thick, and reports show they have helped people to bake their food without the usual fuss and mess that is usually associated with baking. As well as being non-stick, one of the mat’s principle features is its ability to tolerate high degrees of temperature. Additionally, as these mats are 1mm thick, they can be used for a longer period than the majority of similar products available online. While, typically, parchment papers and other poorer quality mats have tended to fold when used continuously, this set consistently retains its original form. to recreate and exceptionally tasty to eat. prepare significantly healthier food with a dramatically decreased fat content. the kitchen. Therefore, from the reports provided to date, it would be fair to say that this set has already proved to be effective, long lasting and, best of all, comes with a lifetime guarantee.